Hearing screening is both part of Newborn Screening and is one of many Early Hearing Detection and Intervention (EHDI) programs that tries to identify anyone with hearing loss as soon as possible in order to prevent further loss of hearing and assist the child in his or her development. Did you know that one to three out of every 1,000 children are born with some degree of permanent hearing loss? This is known as congenital hearing loss, and it is one of the many conditions tested for during a process called Newborn Screening. Nearly every child in the United States goes through newborn screening, but the amount and type of screenings varies from state to state. There are a few different steps to Newborn Screening and the hearing screening is only one of those. Hearing screening is both part of Newborn Screening and is one of many Early Hearing Detection and Intervention (EHDI) programs that tries to identify anyone with hearing loss as soon as possible in order to prevent further loss of hearing and assist the child in his or her development. There are two different tests that can be used for the newborn hearing screen: the otoacoustic emissions test (OAE) and the auditory brain stem response test (ABR). no echo occurs, this may mean the baby has hearing loss and he or she will undergo further testing. ear and small electrodes are placed on the head to detect the brain’s response to sounds. If the baby’s brain does not consistently respond to the sounds, then he or she may have a hearing problem and will need to undergo further testing. WHAT DOES IT MEAN IF MY BABY FAILS THE HEARING SCREEN? two to 10 percent of babies fail their first hearing screen in the U.S., but very few of them actually have or develop any kind of hearing loss. 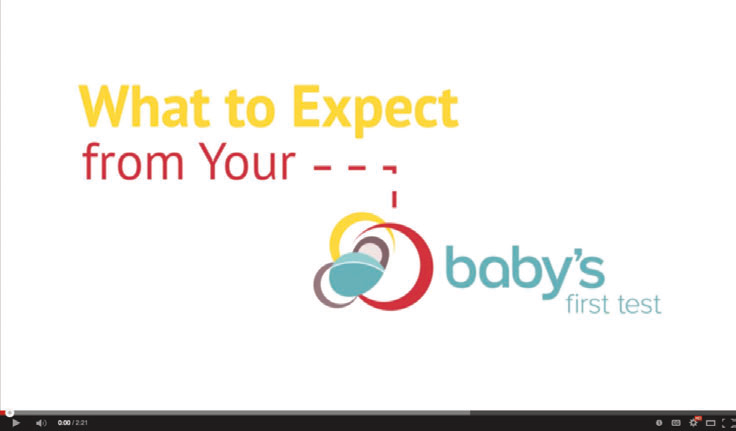 Regardless, scheduling and attending your baby’s follow-up testing is important to know for sure if your baby has, or will develop hearing loss. All babies who fail the first test will be directed to an audiologist to examine the ears more closely. The baby will undergo a complete audiology evaluation made up of a few different tests to more fully examine the baby’s hearing. The audiologist may use the ABR or OAE in addition to other tests. These tests will not only indicate if the baby has hearing loss, but also the type and the severity. WHAT IF I SUSPECT MY BABY HAS HEARING LOSS? Early detection is critical for your baby’s development, so if you notice any of these signs or otherwise worry about your child’s hearing, you should contact his or her pediatrician immediately to schedule another screen or examination. If the diagnosis is made early enough, the language development (spoken or signed) of a child with hearing loss can be on par with his or her hearing peers. Treating and managing hearing loss varies from person to person depending on when the diagnosis was made, the type and severity of the hearing loss, and the cause, which can be genetic or environmental. One of the biggest parts of managing hearing loss is regular follow-ups as well as close monitoring of the child’s hearing as he or she develops, because his or her hearing will likely change. Although there isn’t a cure for hearing loss, there are many options to utilize the hearing that your child does have, or to communicate in other ways. Every state has different resources for early intervention programs, which can be found here: http://ectacenter.org/contact/ptccoord.asp. family friendly materials around genetics and health to communities. est laoreet urna, at euismod ipsum dui et diam! Curabitur ut tortor purus. Cras velit risus, fermentum sit amet rutrum vel, aliquam eget quam. Cras non purus sit amet est semper varius ac id diam. Vivamus et neque at orci tincidunt pulvinar. In consectetur gravida egestas. Phasellus ac augue est, sed pharetra lorem. Sed vitae tortor urna.